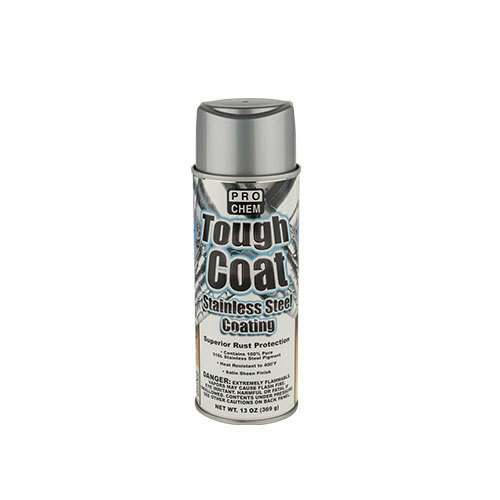 Tough Coat | Pro Chem, Inc.
TOUGH COAT is a super tough, long lasting coating containing pure stainless steel pigment combined with a highly resistant epoxy ester resin to produce a coating resistant to corrosion caused by harsh chemical environment, weather or abrasion. Seals, beautifies and protects metal, wood, ceramics and more. It can be used indoors and out. Tack free in five minutes, hard cure in two hours. Surface must be clean and dry before painting. For best results, use when can is between 70° and 90°F. Shake can at least one minute before and occasionally during use. Spray surface with steady even strokes at a distance of 8 to 10 inches. Several light coats give a better finish than one heavy coat. If clogging develops, turn spray button ¼ turn or remove and clean button slot. Do not stick objects into can opening. After painting, turn can upside down and spray for two seconds to clean spray button. Discard empty can in trash pickup. Do not incinerate or compact.